Yin deficiency fire flourishing upwards causing night sweats, low grade tidal fever, feverish palms and soles, menopausal hot flashes, palpitations, insomnia and anxiety. 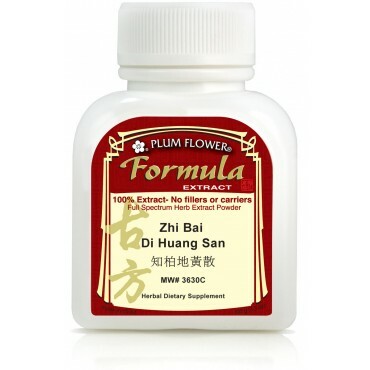 Applicable for deficiency heat associated with menopausal disorder, hypertension, hyperthyroid (Graves Disease), chronic urinary tract infection and rheumatoid arthritis are some of the imbalances satisfied clients have used this product for. Rehmannia glutinosa root-prep, Cornus officinalis fruit, Dioscorea opposita rhizome, Alisma orientalis rhizome, Paeonia suffruticosa root-bark, Poria cocos fungus, Phellodendron chinense bark, Anemarrhena asphodeloides rhizome. - Shu di huang, Shan zhu yu, Shan yao, Ze xie, Mu dan pi, Fu ling, Huang bai, Zhi mu.